East Asia has a strong influence on the global demand for seafood. Australia already exports significant quantities of seafood products to Asian markets, and is highly regarded by overseas markets as a safe and premium-quality supplier of seafood. Yet very little dried seafood is produced within Australia, priming domestic producers to explore Asian markets where local competition is low and consumer demand outstrips supply. Many dried seafood products are considered delicacies and can attract extremely high premiums. Drying undervalued or underutilised local seafood stocks as a means of extending existing product lines, whilst entering new markets provides an attractive opportunity for West Australian seafood processors. 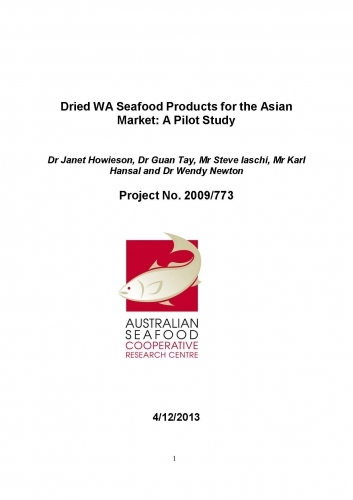 In 2009 Kingsun Bioscience Company, an international company with interests in the Japanese and Asian markets expressed an interest in investigating the possibility of drying WA seafood products for sale on the Asian market using an innovative ambient temperature vacuum drying process. The technology involves production of a vacuum state. In this vacuum, evaporation can be achieved at ambient temperatures. A significant advantage of ambient air drying is that the structure of proteins remains intact and is not denatured by heat. Furthermore, the flavour profile of the seafood is not compromised by a high temperature cooking process. West Australian dried seafood products were created by developing optimised pre-treatment and drying conditions; producing safe, ready-to-eat vacuum and freeze dried products, having the potential to be implemented on an industrial scale. In this study sensory proximate composition, physical properties and food safety analyses has shown that products produced using vacuum drying technology were within acceptable ranges of results obtained from traditionally processed equivalents purchased on local and Asian markets. Drying trials confirmed that the quality of fresh Australian seafood was reflected in the dried products with microbiologically and chemically safe products produced. The project has demonstrated the production of shelf-stable, food safe dried products from up to 10 different WA seafood products.